There are shelves and shelves of shampoos, solutions, conditioners and concealers that promise to thicken up thin hair. On the opposite end of the spectrum, little attention is paid to the gals and guys who wish to make their thick hair a little finer and more manageable. Going from thick to fine is totally possible, but first you have to choose whether you just want a lighter look or if you're actually willing to lose some locks. Leave a bit of conditioner in your hair rather than rinsing it out completely -- give your hair a quick rinse of cool water instead of a long drenching under a hot shower. This keeps your hair from getting too puffy, creating a thinner, finer look. Apply a straightening balm to your hair before you blow-dry, especially if your thick hair is also coiled or prone to tangles. Request a haircut from your stylist that takes weight and thickness out of your do, such as loose waves with bangs for medium-length hair. For long, straight hair, go with long bangs and long hair around the crown, with plenty of texture in the last 4 or 5 inches of hair -- this will give your hair a little lift while reducing the thick, puffy look. If you're willing to go short, choose a graduated bob for a light, fine look. 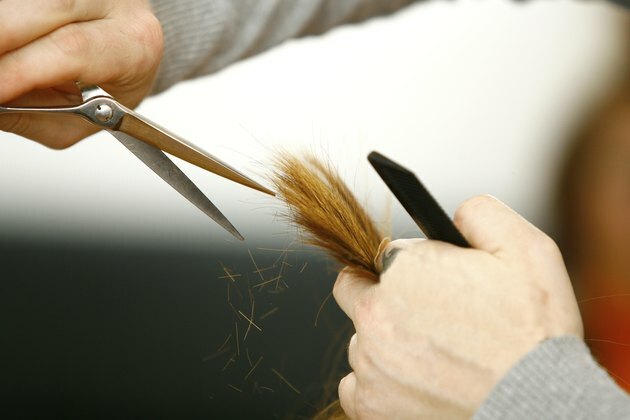 Style your own hair to give it little lift, taking some weight off the long, heavy strands for a lighter, springier look. For very long hair, a topknot, up-do, high ponytail or a little extra lift on the crown helps achieve this effect.